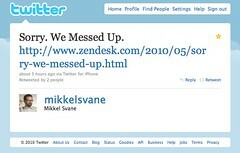 In the wake of the Zendesk Price Fiasco of 19 May 2010, in which SaaS helpdesk vendor Zendesk announced pricing hikes which negatively affected most of their users (and would have caused a doubling for us), and after which an angry firestorm erupted, Zendesk users received an email apology from CEO Mikkel Svane today, and more information in his blog post. I have a bit of a bitter taste in my mouth after having been treated that way, but let's let bygones be bygones. I very much appreciate the real grandfathering they have extended to existing customers.